Kubota’s GR2120-54 is equipped with revolutionary technology, including Kubota’s exclusive ‘Glide Steer’, which offers excellent manoeuvrabilty and exceptional traction while preventing turf damage. Powered by a 21HP diesel engine, the four-wheel drive model tackles the biggest mowing jobs and rolling terrain with ease. 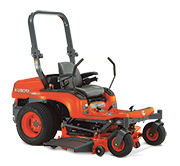 Powered by a Kubota 21HP, 3-cylinder diesel engine, generating a high torque rise that easily handles hours of heavy-duty mowing. 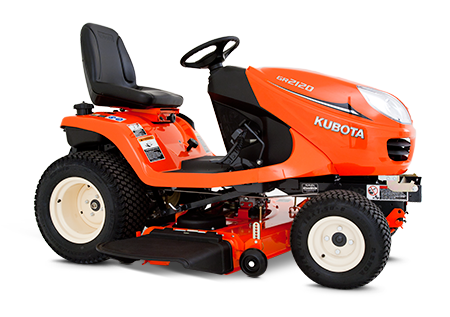 Kubota’s reputable HST transmission is easily controlled by a single foot pedal and produces a smooth and comfortable ride. Soft-touch power steering enhances manoeuvrability, reduces fatigue, and makes operating the GR2120-54 effortless. 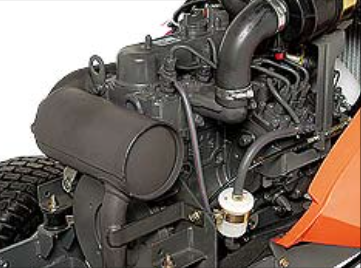 Unlike a belt-drive transmission utilized in conventional mowers, Kubota’s low-maintenance shaft-drive transmission will provide years and years of reliable service. Shaft-drive mower deck and hydraulic PTO clutch deliver reliability with far less maintenance than conventional mowers. No more belts and pulleys to maintain. 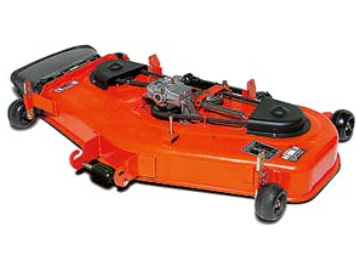 54″ mower deck constructed of durable 10 gauge steel and designed with a 5-inch deep shell for professional and lasting results. Easy to reach cutting height adjustment dial and hydraulic mower deck lift, make achieving professional results easy. For even finer clippings, an optional mulching kit is also available. 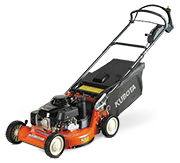 One-piece unit that’s easy to install, Kubota’s mulch system makes clippings disappear into grass, creating a healthier lawn. Incredibly sturdy yet lightweight, the large-capacity, 350 litre grass catcher lets you mow longer with fewer stops for emptying. Oversized and generously padded, the GR2120’s suspension seat can be adjusted to provide a high level of comfort to a wide range of operators. The full-flat open platform minimises operator fatigue with plenty of legroom. For additional comfort, optional arm rests are available. Weight adjustment dial allows the operator to customise the seat suspension for increased comfort. 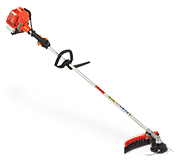 Height adjustment dial allows the operator to easily and quickly adjust the mower cut height from 1″ to 4″, in 1/4″ increments. 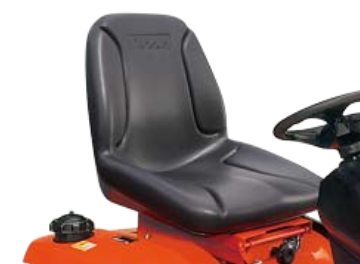 Ergonomically positioned to the left of the operator, the hydraulic lever provides simple and effortless lift/ lower operations of the mower deck.